Ed Krupicka has now worked for State Farm for a half century. His daughter is also marking a major milestone: She's worked for him for 30 years. Ed Krupicka, a lifelong resident of the Woodburn area, marked his 50th anniversary of working as a State Farm employee on June 1. His daughter, Heidi Hammack, is also marking her 30th anniversary of working for her father in his Woodburn office. Krupicka hadn't always planned on working in the insurance industry. He served in the U.S. Navy for three years, working primarily in Hawaii and the Midway Islands. After that, he came home to Oregon where he worked for a paper mill for about a year and went to school for a couple of years. "I had a State Farm agent and I needed to change the cars on insurance," Krupicka said. "And he suggested that I contact State Farm for employment." Krupicka took his advice, and in the 50 years since has worked his way up through the ranks. He says his first 13 1/2 years working for the company were out of a regional office in Salem. He started as a fire underwriter, then was a field representative for five years, then was a commercial underwriting supervisor. Finally, in October 1980, he became an agent with his own office in Woodburn. Not long after he became an agent, Krupicka said his daughter became interested in working for him. "I had one team member at the time, and I needed somebody else. So I asked my wife, 'Do you think Heidi would work in the office?'" Krupicka said. "Heidi was working at a little earring, jewelry store at the time. (My wife) said, 'Funny thing you should ask, because Heidi just asked if I thought she could come and work for me.'" Hammack became a licensed insurer, and has been working with her father ever since. Both Hammack and Krupicka acknowledge that their ability to work together for 30 years is pretty unusual. "Some people can't work with their parents. I can," Hammack said. "For the most part, we're pretty easygoing." Hammack said that in the office, she doesn't call Krupicka "Dad," instead referring to him as "The Boss." Krupicka said that working with family means that there's a bit more flexibility in terms of what's expected. He's more comfortable asking Hammack to work through lunch, for example, than an employee that he's not related to. And Hammack has some flexibility in terms of when she can ask for time off, as long as somebody else will be in the office. "It works both ways for us," Krupicka said. Both have witnessed a lot of changes in the industry over the years, especially when it comes to technological advances. Krupicka remembers using microfilm readers when he first started out. Now, much of their business is done on the computer and online. Krupicka said those technological advances have allowed them to provide better service to policy holders. And, more customers are drawn to buying their policies online, which Krupicka said is sometimes challenging. "Insurance is a complicated product, and most people really need somebody who knows insurance to explain it to them," he said. "So people who just buy it online, they don't have that interaction." 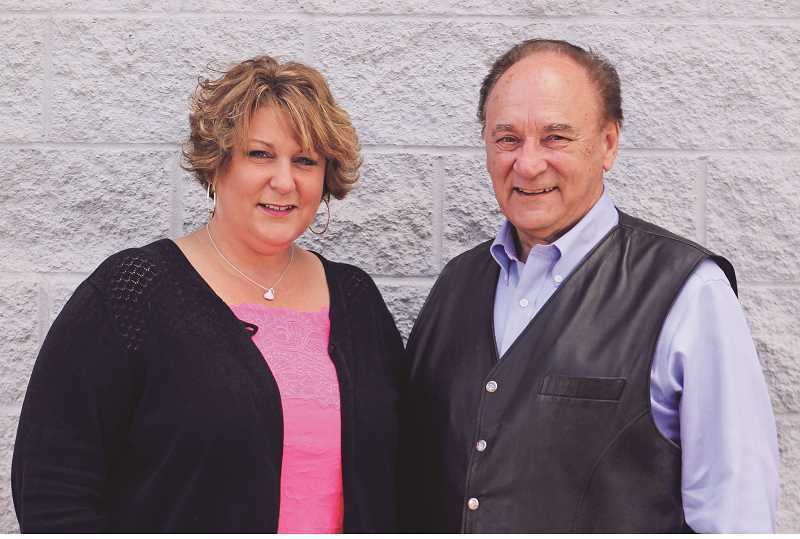 Customer interaction is important to Hammack and Krupicka, who both say that making connections with customers are their favorite part of the job. "You build this relationships with customers over a big period of time and some of them are like family members," Hammack said. "When I had my first child, several customers would bring in gifts. I still have those gifts. One hand made a sweater for my son." Krupicka has been a member of Woodburn Kiwanis and the Knights of Columbus in Gervais for about as long as he's been an agent, which he says has strengthened his connection to the community. "The small-town atmosphere is what I like," Krupicka said. "You get to know a lot of the business people in the community and I think it's more gratifying to be involved in a community when it's a small community."